Note the distinct white throat, blue-grey head and brown-grey back. You can just see the white edging to the birds tail feathers. Also note how difficult the dark smudge across the eye can be to see. The dark legs and lack of eye ring confirms the birds identity. This bird appears much browner and the dark eye smudge much more distinct. Both birds can share the same habitat and have similar distribution, except the Lesser does not breed in most of Scotland. The distinctive white throat and grey head is common to both birds but the birds back colour is very different with the rich chestnut of the Whitethroat differentiating it from the dull grey-brown of the Lesser. 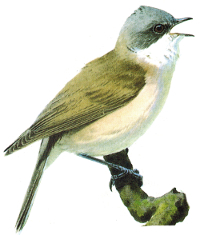 The birds legs are different colours with the Lesser having almost black legs and the Whitethroat having pale orange. The dark smudge on the Lesser's face can be distinctive depending on light conditions. The underside of the bird is pale with very grey back and head, note the dark outer wing feathers and the slight dark shading of the shoulder. Also seen in the more brown bird above. The male and female birds are very similar with the female being only slightly duller. A very secretive bird which prefers to sing from deep within the undergrowth, frequently changing places before it can be located. 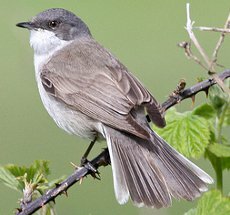 The Lesser Whitethroat is slightly smaller than the Whitethroat and both birds often share the same habitat although the Lesser prefers taller trees and bushes. Thick dense tall bushes and scrub often at the edge of woodlands. Is regularly recorded in reed beds. A summer visitor to the UK, breeding in almost all of Europe and the UK, except Scotland. Considered a common bird in Europe, winters in Africa and India.